This post is sponsored by Darling Clementines®. All ideas and opinions are my own. From the hustle of early morning wake-ups to feeding famished kids after school, it can take families some time to get into the groove with Back to School. Come October, many parents start to focus on the next big thing though: flu season. However even amidst our efforts to get flu shots and fight infection at home, I know many families are also looking for ways to use food as immune-boosting medicine as well. That’s why I love this smoothie featuring Darling Clementines®. Clementines are a familiar Fall favorite. You can toss them in backpacks as an option that doesn’t bruise nor brown in a lunchbox and they’re easy enough for little ones to peel on their own. Did you know that Darling Clementines® are available year-round though, thanks to the variety of growers harvesting them every month of the year? That means that when other summer fruits move out of season and become grossly expensive by now, Darling Clementines® continue to be an easy, economical fresh fruit option for our families all year. In this smoothie, Darling Clementines® offer a vibrant orange color that makes it perfect for Fall and all the festivities in October. They also offer the vitamin C and flavor to make for a cold-fighting smoothie your kids will love slurping down. You can offer this smoothie as an easy grab-and-go option on the way out the door in the morning or have it ready as part of nutrient packed afternoon snack. Whenever you choose to enjoy it, this immune-boosting clementine smoothie is one your family will want to have in its immune defense arsenal this Fall! Add all of the ingredients to a high-powered blender. Blend until smooth, adding additional coconut water and/or ice until desired consistency is achieved. Enjoy! 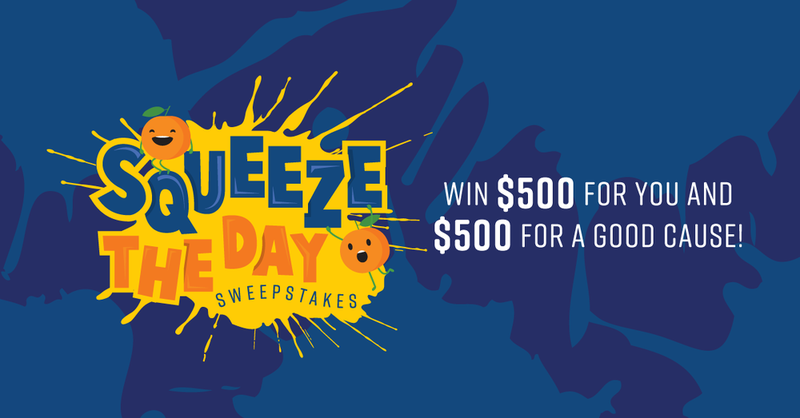 In case this smoothie wasn’t sweet enough for you, be sure to enter Darling Clementines Squeeze the Day Promotion Sweepstakes. Fill out the simple entry form (it takes less than 30 seconds to do here) and be entered to win a $500 gift card for YOU, plus a donation to a partnering charity. This costs you nothing to enter, but could afford you $500 to spend how you choose (maybe on a lifetime supply of clementines?!). Enter here, or be sure to check out Darling Clementines for more on this festive and cold-fighting fruit! This post is sponsored by Healthy Height. All opinions are my own. Summer is here, which seems unanimously to come with kids’ endless requests for a snack. Somewhere in the flexibility of being home more and the need for boredom-busters that often have kids ending up in and around the kitchen though, kids constant questioning “can I have a snack” is one that parents can start answering with a more proactive approach. Instead of feeling pressured to either provide a snack upon being asked or to tame the hangry temperament until the next meal, this post will help parents to make the most out of each bite offered with quick and efficient fuel ideas. As with when I have shared about how to build a healthy snack, one thing that continues to be an area of emphasis is to offer a balance of nutrients. One of the reasons kids often ask for endless snacks is because they aren’t being satiated enough with a given snack. While starchy foods more traditionally seen as “snack foods for kids” are often enjoyed in large amounts by little ones, they lack the nutrition to effectively fuel a child for their high energy and spurts of activity in between meals. Additionally, for children who may need snack options that pack in more nutrition to help promote growth as well, snacks become an especially opportune time for each bite to be optimized. Rather than filling up the precious real estate of a child’s stomach with “filler foods,” parents can also use the following principles as criteria for what to include in their child’s snack offering. That’s one of the reasons why I always encourage parents to “boost each bite.” What I mean by that is to find small, subtle changes that add major nutrition to your child’s otherwise normal snack. Although you can always add a scoop of ice cream to their smoothie/shake or offer processed, high-fat food for merely more calories, it probably goes without saying that these aren’t my ideal “boosts.” Instead, I love encouraging parents to try out other products on the market that help to deliver more nutrition with each bite, sip, or slurp. As you will see in the examples below, I like to suggest the idea of using a kid-friendly protein powder, like Healthy Height. I know that nutritionally it adds the boost children need in their diets. Equally important, I trust this product is backed by pediatricians who saw the need for a healthier shake supplement and have since created this as a safe, more-natural alternative for families (with less sugar than its competitors). While having snacks that include any one of these components can be sufficient for some or when a small snack is merited, including options that include protein, fat, and/or fiber will help to both fill and fuel your child for longer. As the most asked about macronutrient by parents, protein is a hot topic of concern. Many parents are concerned their children don’t eat enough protein (click here to see how much young kids need! ), especially in the form of proteins often offered at meals like meat, poultry, seafood, beans, or eggs. That’s why finding creative ways to get protein in at snacks can help to both lessen the concern on how much children eat at mealtimes while also providing them with valuable fuel that helps them to feel full longer. With more calories per gram than either carbohydrates or protein, fat offers a nutrient-dense way to make a snack more satisfying. That means, bite for bite, your child eats the most calories from fat (compared to from carbohydrates or protein). Fat also helps us to feel full longer, so simple swaps of low-fat options for higher-fat ones or additions of healthy fat options can help curb kid’s hunger even if they only eat a few bites. This is a great reason why adding fruits or vegetables to a snack helps to not only round out what is offered nutritionally, but also provide an element that promotes added fullness. Fresh fruits and vegetables are always an easy idea to add to a snack, as is dried fruit if parents want an option that holds up better in the heat and provides more compact calories (energy!) than fresh alternatives. Any parent knows there is a need for both quick AND efficient snacks when fueling small stomachs. So instead of reaching for snacks with empty calories on the regular, consider the above advice and ideas. Use these to help brainstorm ways that you could help your child to make the most out of every bite by adding in more protein, fat, and/or fiber at snack time. Also, if your child’s pediatrician has suggested you try Pediasure, Carnation Instant Breakfast, or any other oral supplement to try and promote more nutrient-rich options in the diet, I encourage you to check out Healthy Height. Since Fall in Texas still means it's consistently over 70 and even 80 degrees, this has been a Fall favorite with my family. It mixes the flavors from the season with the nutrient-dense foods my growing girls need, making it a perfect snack or after dinner treat! Be sure to check out my dietitian mom tip at the bottom of this recipe as well! Pour yogurt onto parchment paper. Using a rubber spatula, evenly spread out until about 1/4-1/2 inch thick. Add pumpkin purée to yogurt. Gently mix in. Again spread out out mixture until even. With hand 12” or so above yogurt mixture, sprinkle hemp hearts evenly on the surface. Repeat with Halloween sprinkles. Put in the freezer for 1-2 hours or until firm. Remove pan from freezer, lift parchment paper, and gently break up frozen yogurt bark into large pieces. Serve immediately, storing extra pieces in air tight container with parchment paper in between layers. Enjoy! Note: These will thaw quickly, so best to return pieces to the freezer in between requests for seconds! We rarely ever have foods containing food dyes in our home, sprinkles included. But for some certain seasonal items that I know will be short lived and likely live in the attic until next year, I do bend some of my standard "what I buy and why" standards. This not only helps me fit in other key foods like yogurt, pumpkin, and hemp seeds, but also makes a less exciting snack all the more fun amidst a holiday season that can be so all about the sugar. So just remember - YOU are the nutritional gatekeeper. The call is yours! But sometimes, I will give my dietitian blessing to loosen up a little bit and add a little fun for the sake of the big picture. No? Well it's probably a good thing that neither of us is on edge then. Because one thing you don't need to worry about scaring me with is the amount of candy our kids will soon be seeing. As a registered dietitian and mom of two, I am well aware that with the start of this holiday season and namely Halloween comes A LOT of candy. And although it might surprise you, I am actually okay (or at least at terms!) with it. That's because my main goal in raising healthy eaters is for them to establish a healthy relationship with all foods, including all of the sweets stuffed into their little plastic pumpkin pales. In my ideal world, all families would hand out jack-o-lantern satsumas and mummy-wrapped boxes of raisins. But in the real world? That's just not happening, even in my home. That's why I think the sticky subject of sweets this time of year needs to shift less on if/whether and how much candy our kids eat (remember, that's THEIR job!) and more towards what, when, and where we allow sugar to be offered (since that's OUR job!). When my sweet friend Ashley over at The Littles and Me asked if I wanted to do a Halloween Boo Breakfast for our monthly collab, I couldn't resist. I can talk about sugar and managing "forbidden foods" all day, how much sugar is recommended, how we can help curb our kid's cravings for it, and the most common concerns I see with how parents handle sugar. But what I really want to highlight this year is how we can assume a healthy, balanced approach to the Division of Responsibility in feeding - even at Halloween. It starts with determining what, when, and where our kids will be exposed to the sweet stuff. By planning for fewer added sugars in the foods you offer your family everyday, you are opening up more margin in your kids diets for a few sweet treats when offered elsewhere. You are acknowledging that they will likely be eating more sugar than their tiny tummies need elsewhere and planning meals and snacks at home accordingly. You are making wise food choices that both fuel and fill your kiddos, so when candy is around, you know they aren't scarfing it down because you didn't do your part to feed them properly. Above all, you are embracing the joys of Halloween and helping your child learn how to healthfully and happily to do the same. This all starts with Halloween Boo Breakfasts like this one! With seasonal flavors, wholesome foods, and zero added sugars, make your tiny monsters this Boo Breakfast and you will both start the festivities feeling good. Turn on and blend until well mixed. Serve in a spooky glass and enjoy! I found these cute glass cups with lids and straws at Target in the dollar section (score!). I just added googly eyes and an "O" mouth on it myself, or you can use the ones Target has already pre-printed fun Halloween images on. Ashley also shares in her Boo Breakfast decoration ideas how you can make an easy, disposable cup option on the spot, so check out how here! You can use any pancake recipe you prefer for this recipe. Just make sure it is thin enough to be squeezed out of the container to create the spider web. I chose this festive, pumpkin recipe below minimally adapted from @lunchesandlittles. In a large mixing bowl, add all of the dry ingredients. Stir until mixed, then set aside. In a small mixing bowl, add milk, applesauce, melted coconut oil, and pumpkin puree. Stir until well combined. Add bowl of wet ingredients to large mixing bowl with dry ingredients. Stir until ingredients are mixed. Using a small plastic squeeze bottle, transfer pancake batter from large mixing bowl to squeeze bottle. If coconut oil has hardened at all in the mixing process, run it under hot water for a few minutes until it liquefies again. 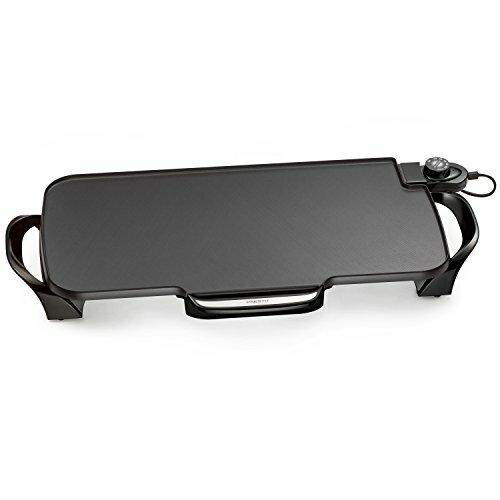 Preheat a large griddle or pan to medium heat. Use additional coconut oil to coat, as needed. To make spider webs, start by squeezing pancake batter in the shape of a large plus sign ("+"). Going diagonal over those lines, squeeze pancake batter into a large "X". Use squeeze bottle to then connect the end of the lines with small little inverted lines of pancake batter. Add a center circle between the center axis and the otter "webbing." As pancake begins to brown and batter starts to bubble, gently flip pancake using a large spatula. When pancakes are cooked, remove from griddle/pan and put on plate. Decorate with a plastic spider and serve! This recipe is AMAZING as is. Even for my syrup-loving littles, we found the stand alone spider web pancakes were totally satisfying without any added sweetener (mixed in or on top)! 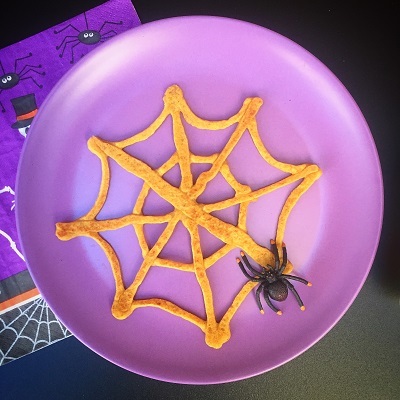 Encourage your kiddos to enjoy the spider web and smoothie without syrup to save some of that added sugar for all the other sweets being offered at other events. I found our squeeze bottle at the dollar store. 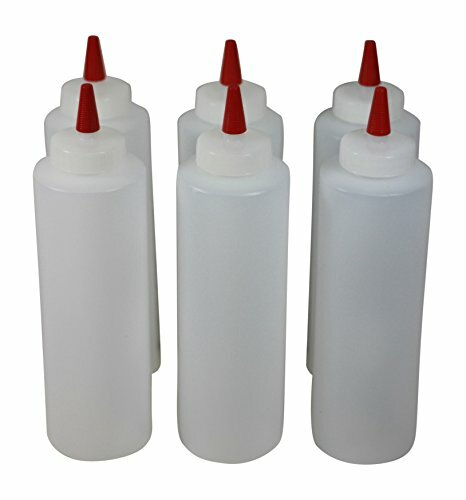 You can also use an old ketchup bottle thoroughly washed out, or get ones like these off of Amazon (affiliate link; item shown below). If the tip is too narrow to let the batter pass through, just cut a slight bit off until you are able to squeeze easily. Below are affiliate links to my pancake-making arsenal. As always (see my legal page here), using these links doesn't cost you anything extra. The small commission earned just helps Veggies & Virtue to provide more fun ideas like this one! Make it a More Festive Affair! Be sure to find the BOO-tiful breakfast set-up that Ashley over at the Littles and Me shared. 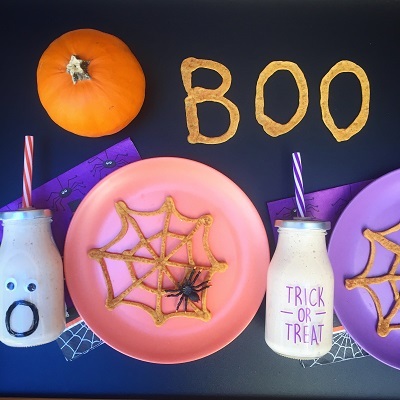 You can see from the image below, these decorations and easy to use printables are perfect to go with the Boo-Nana Smoothie and Spooky Spider Web Pumpkin Pancakes from above. So hop on over to the Littles and Me to get these Halloween Boo Breakfast decoration ideas and free printables! Wishing you and your little pumpkins a very happy and healthy Halloween! I'm not sure why I just can't help but see a book and imagine a snactivity to go along with it. Get it: snack + activity = snactivity. So clever, I know. But I am totally claiming this and running with it. I had actually never heard of this book until Beth and Ludavia suggested it for this month's collaboration. I ordered it and quickly saw why it will become a new seasonal favorite in our family as well. Since I am not the educational expert on this book, I will leave all of that to Beth, Ludavia, as well as Alison and Tara. Be sure to read all the way to the end of this post for links to their activities for this book! For now, here is the "how to" for this month's snacktivity! The recipe is a kid-friendly, fun way to strength story time and snack time with simple yet healthy staples. *For a whole-grain, nut-free pretzel option, we found some extra-long pretzel sticks that come in small snack packs at Sam's club. One snack pack would make about 20 broomsticks! With your peeled carrot and a parent's help, remove the top stem section and pointed end. Cut in half lengthwise, so the carrot's center is lying flat on the cutting board. Cut lengthwise again 4-5 times until you have several long strips of carrot. With these, lie each carrot strip on its side so that you can remove the rounded outer side. This should make the section of carrot a large, long rectangle. With the carrot, then create your "broomstick" handles by cutting these larger carrot rectangles into shorter ones with a square diameter. Once you have six carrot "broomsticks," set aside. With you cheese sticks and a parent's help, cut the cheese stick in three equal parts. Using a sharp paring knife, cut an "X" on one end of the cheese piece. On the other end, use paring knife to cut a tic-tac-toe board half way up the length of the cheese piece. This will leave you with an "X" on one end (to later enter the broomstick in) and nine small sections of cheese on one end (to later "fan out" like a broom). Repeat on the remaining pieces of cheese until you have made six cheese "brooms." Set aside. Using either your carrot broomsticks and/or in combination with long, pretzel sticks, gently insert the "broomstick" into the "X" on each cheese piece. Using a long, uncut chive, lie it flat and place the complete broomstick (broom + stick) onto the chive so that the chive is about just barely below where the broomstick meets the broom. Gently tie is, then use the paring knife or kitchen sheers to gently cut off any excess. Repeat with eat broomstick. Gently fan out the base of each cheese piece where the cheese was sliced into nine sections. 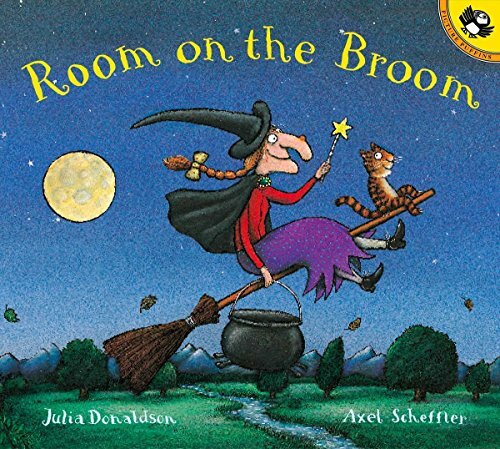 Then share and enjoy your snacktivity while reading the story, "Room on the Broom!" Creative learning activities to make this snacktivity even better! 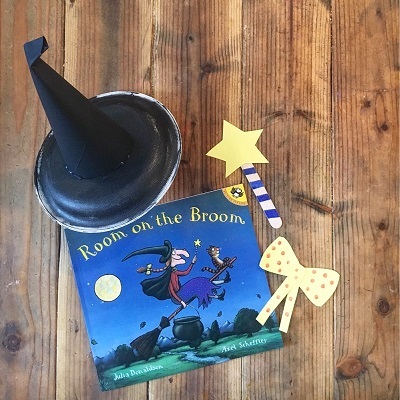 For more activities from this month's Room on the Broom collaboration, please be sure to check out each of the awesome ideas below! Ludavia over at The Mama Workshop came up with these darling little paper plate witch hats, paper bows, and craft stick wands to do a scavenger hunt. Find out how to make your own by seeing her activity HERE. Beth over at Days with Grey always does an amazing job breaking down any story so kids can learn to retell it using everyday craft items you probably already have on hand! Check out her cute popsicle stick activity HERE. Tara over at Little Pine Partners has the most creative ways of using nature to teach core concepts to kids. I love the two activities she came up with using clothespins and story stones for Room on the Broom! Find them HERE. Allison over at Yoga Pants & Pearls gives us this great sequencing activity (plus printable!) to put together our own little broomsticks. She also includes how you can use the broomstick for a painting project too on her post HERE. To be in the know each month when we do a Read with Recipe Snacktivity, be sure to sign up for my newsletter so you get them straight to your inbox! Happy Fall, and remember -- there's always Room on the Broom (plus room for snacks!). I admit, avoiding peanut-containing products is not something I think about personally on a day to day basis. I must eat gluten-free and was dairy- and soy-free while breastfeeding our oldest, but peanuts have thankfully never been a key food for concern with our family. As we all get back into the swing of the school year though, peanut-free foods naturally get pushed to the forefront of all our minds (and rightfully so). With an estimated 1 in 200 kids having a peanut-allergy (according to Kids with Food Allergies), we are seeing more and more peanut allergies in the average classroom. More so, each of us are meeting families whose lives are impacted by keeping their child with food allergies free from harm in a variety of environments. Although school is an obvious place for us all to start, there are other ways we can continue to extend our support to these families by establishing peanut-free environments and allergen-safe activities. That’s why my friend Ashley, over at the Littles and Me, and I want to highlight how you can host an allergen-friendly play date with peanut-free snacks! Any of us with young kids know that play dates are the social gatherings that spur young friendships and create community around our kids. We want these for ALL kids, don’t we? Play dates should be an undeniable rite of passage for our kids and one we as parents work hard to protect – even if that means going peanut-free. That’s why this post is going to go outside of the classroom to consider how else we can support kids with food allergies. Imagine a fellow peanut-free parent’s peace of mind if their kid could enjoy a playdate “just like everyone else” – free from fear over an anaphylactic occurrence. Let’s make that happen together, as families supporting families with food allergies. In this post, we will highlight what are the best peanut-free foods to offer, how to take proper precautions to ensure a peanut-free environment, and how to talk to your kids about food allergies and their friends. Although these suggestions can be added inspiration for peanut-free lunchbox ideas as well, here is what you need to know specifically about hosting a peanut-free play date. A special thanks to my peanut-free mom friend, Beth over at Days with Grey, for her taking the time to review and give firsthand feedback on this post! She shares another valuable post on peanut-free parties here. Want to find your own peanut-free snack ideas for a play date? Follow these tips when shopping for safe, peanut-free snack foods. Children’s allergies can vary in severity but the following five steps can help ensure the proper steps are taken to eliminate peanut-containing and/or cross-contaminated products. Always check the ingredients list and product label for peanuts. Don't assume because a food doesn't naturally contain peanuts that it isn't cross-contaminated through manufacturing. Check for the statement “Contains: Peanuts” beneath the list of ingredients. This is required by the federal Food Allergen Labeling and Consumer Protection Act (FALCPA). Look for an advisory statement. This may include a statement that reads, “may contain peanut” or “made in a facility with peanut.” While these are voluntary, it is good to avoid any item that may contain traces of peanuts when planning your peanut-free playdate. Contact the manufacturer. As stated on SnackSafely.com, "due to flaws in US labeling rules, it is impossible to tell whether a product is safe from the label alone." For this reason, it is best to check the company’s website or call the company’s customer service to see if the food item is manufactured in a peanut-free facility any time you are in doubt. Sometimes, one item in a product line is safely “peanut-free” and another item from the same company is not; so when in doubt, reach out to the company to clarify. Use peanut-free resources. Still feeling unsure about safe peanut-free snack ideas? Consider downloading a free, peanut-free guide like this one for a list of peanut-free food options that is updated often. Stay up to date. A product’s peanut-free status can change frequently, so never assume an item that was peanut-free still is. Check labels, call the manufacturer, ask the child’s parent, or use a reference guide to keep up with which items are safe to offer. Looking for tried and true peanut-free favorites to offer at play dates? Here are 12 of our favorite go-to's! Thoroughly clean all equipment. If preparing any foods at home, be sure to thoroughly wash and clean ALL equipment from cross-contamination, including items like knives, cutting boards, and counter tops. When in doubt, avoid using kitchen appliances that are harder to clean like toasters, blenders, or other items that may have been used previously with peanut-containing foods. Plan ahead. If you know you have a peanut-free play date on the calendar soon, try to avoid offering peanut-free items in the days preceding. This helps to lessen the chances of cross-contamination while giving you plenty of chances to clean counter tops, booster seats, kids tables and chairs prior to the play date. Communicate openly. Parents of children with food allergies tend to be among the most educated resources out there on establishing safe and peanut-free environments, so show your support by seeking out their input on anything you have questions about. Nothing reassures a parent (whose child is peanut-free) more about the upcoming play date than you showing you care and concern to keep everything as safe as possible. First, educate yourself more on peanut allergies by learning more at Kids with Food Allergies. Practice how to talk with your kids about food allergies with sample ideas here. Show your child this episode of Daniel Tiger on food allergies. For older kids, consider this lesson plan from Arthur’s “Binky Goes Nuts: Understanding Peanut Allergies” for a fun and interactive way to engage your kids in allergy education. Talk with the family beforehand to let them share about their food allergy in a welcomed, warm environment. Time to (safely) Snack & Play! With "safe snacks" and manufacturing practices constantly changing, this is something that requires our ongoing attention to. By partnering with our children's friend's families and food companies, however, we can establish a safer environment for children with food allergies. Be sure to hop on over to Ashley's allergen-friendly play dough pack at theLittlesandme.com. Disclosure: This post is sponsored by Sneakz Organic. As always, all opinions and recommendations are my own. For more on my disclosure policy, please visit my legal page. I know a lot of us parents struggle with what veggies to include in a lunch box without defaulting to baby carrots and dip each day. While that is a fine option, older kids may get burnt out of that offering and younger kids likely can't (safely) crunch their way through it. That's why I have created this list. With 25 ideas for how to include a variety of vegetables in each lunch box, you could literally offer a different option each school day of the month! I know this list will help to spur on some new ideas, get you out of a "what to offer" rut, and help your family shop for some fun new offerings this school year. Be sure to grab my FREE shopping list at the end of this post with the brands I like for each of the products recommended, as well as all the recipes for the items listed. So without further ado, here is a collection of kid-friendly veggie-based food options that are perfect for packing in lunchboxes -- safe for even those who are still learning to crunch and munch through raw veggies! Frozen Peas: Try tossing frozen veggies in and letting them thaw before lunch time. Grated Carrot Straws: Raw carrots are a choking hazard in kids under four, so consider buying grated carrot straws for your kiddos to try instead. Freeze-Dried Veggies: You can find these most easily online in single veggie varieties or medley packs. Kale Chips: You can make your own or buy them pre-made to increase the shelf life a bit. Cooked (or Jarred) Beets: You can roast your own or buy those that are pre-cooked and in vacuum-sealed pouches. Baked Sweet Potato: Bake whenever the oven is already on for something else and then keep it in the fridge to have all ready to dice up and add to a lunchbox. Peek-a-boo Sugar Snap Peas: Create a slice down the spine of sugar snap peas so that your little one can open them up and play peek-a-boo with all the peas inside! I promise this novelty trick works wonders. Canned Corn: Buy the no-salt-added organic corn and you can literally drain and send it as is! No rinsing or cooking required. Sneakz Organic Milk: If you are already in the habit of sending a juice or milk box instead of just water for a beverage, consider tossing in a box of Sneakz Organic. With a 1/2 serving of vegetables in each milk box, this is an easy, unexpected way to get carrots, cauliflower, sweet potatoes, spinach, and beets in your kiddo's lunchbox. Roasted and Steamed Veggies: Make extra steamed or roasted carrots, broccoli, cauliflower, zucchini spears, etc. to include in the lunch box the next day. Cauliflower Rice: Sick of sandwiches? Include cauliflower rice with a leftover grilled meat and veggie kabobs. "Would-otherwise-go-to-waste" Veggies: Have veggies that went untouched on your child's plate the night before? Add them to a egg frittata recipe or serve them up as mini egg muffin cups. Rainbow Spring Rolls: Use rice paper to roll up a variety of veggies in a spring roll for dinner the night before, then send extra rolls for lunch the next day. For a bonus, tuck in some avocado or include a dipping sauce on the side. Smoothies: Do you have a little extra green smoothie or cauliflower smoothie? Include in a pouch or leak-proof squeeze container. These are awesome recipes you can prep ahead and enjoy throughout the week. Or, store some in an airtight container and stash in the freezer for another week when you run low on veggie-rich options or ideas! Carrot Muffins: These are a staple in our house! PB&J with Beet Berry Jam: Use a non-nut butter if your school requires it, but just don't forget to get those beets in your berry jam as a sweet way to boost the nutrition in this kids classic. Apple + Kale Toddler Puffs: Seriously so easy to make and yet they maintain that light, airy texture toddlers love! I know a lot of parents and kids wish they could have warm, comforting favorites sent for lunch -- especially as the school year progresses and weather starts to cool down. 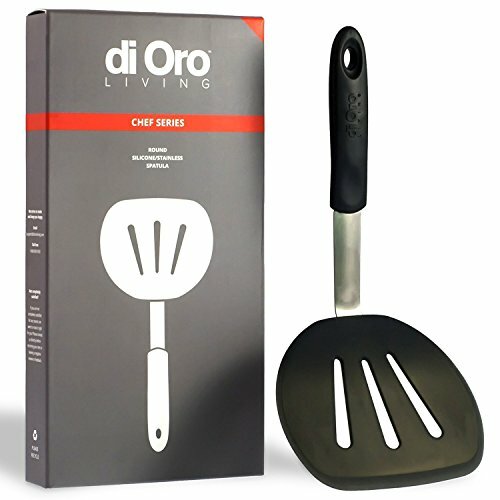 That is why I was SO excited to receive a OmieBox this year (affiliate link). With a space to keep warm foods warm, this lunchbox opens up a whole new world of opportunities, including kid-friendly ways to offer vegetables! Hidden Veggie Mac n Cheese: Get that go-to orange color of mac and cheese without all the processed ingredients, but rather from REAL veggies! Spaghetti: I love spaghetti sauce as a flavorful, family-friendly staple for getting veggies in. Add to whole grain or bean-based noodles, or put on top of zoodles! Tater Tots: These tend to be a toddler favorite for their soft texture and starchy taste. Consider baking up some of the more natural, nutrient dense "tots" or buying pre-made "puffs" that have sweet potatoes, or kale, or a combo of veggies! Cauliflower Pizza: I am kind of amazed how well my kids (who notice ANYTHING "different!") took to this pizza crust alternative! Make your own or buy premade. Want the grocery list for these products PLUS all the recipes for the items listed?